Cottiers Church is a West End institution and much loved local Hyndland landmark. Personally we’ve enjoyed family pantos on Christmas Eve here followed by nibbles in the bar, and many a tipple has been enjoyed in the beer garden on a balmy summer’s day (you remember – THAT afternoon). What we haven’t done for ages has been to journey up the turret staircase to the restaurant. Last Tuesday we corrected that oversight, and how. Recently launched as Leiper’s Attic (after the architect William Leiper who along with Daniel Cottier designed Cottiers) and specialising in showcasing Scotland’s extensive larder we had a treat of an evening. Freshly baked bread with tomato butter and the tastiest olives were placed on our table within minutes of our being seated – along with some delicious Kir Royales. Being a seafood lover I couldn’t resist finding out what a Bowmore Mist on my starter of scallops and sea vegetables would consist of. Turns out the waiter literally sprays your scallops with whisky out of what looks for the world like a perfume atomiser, who knew? Turns out it’s also delish adding a rather tangy note to the dish. For mains I stuck with the fishy theme and went with the succulent wild hake fillet, while the other half devoured a juicy fillet steak in a garlic butter sauce. I particularly enjoyed trying the potato Mull cheddar gratin, so much so I’m now looking for Mull cheddar everywhere I go, the bar has been raised! Alongside our mains we enjoyed a side dish of green beans, roasted shallots and crispy ox tongue that was quickly devoured. The menu isn’t extensive and that instills confidence that each dish will be executed to the highest level, and so it proved. We both agreed the food and dining experience was of a top West End standard in a really unique setting. 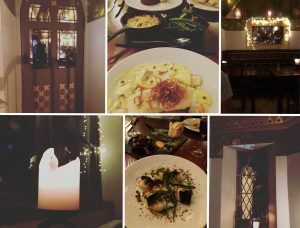 Neither of us can wait to return – maybe after another show in Cottiers theatre, or maybe just because the food is that good it doesn’t require a theatrical add-on to revisit.